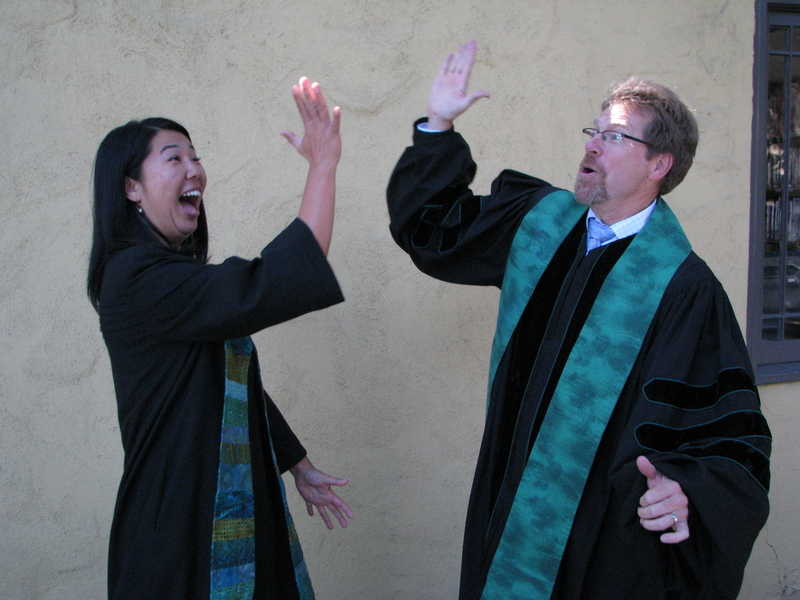 Oh yeah, baby, double honor for those of us who work hard at preaching and teaching… hahaha. (I kid, I kid). So, every day of my “Jesus year” I am writing down 3 things that I’m thankful for. I can’t believe I’m still upholding this practice, but I’ve been logging the three things faithfully every night in a journal. Recently, I flipped through the pages to see what I had written over the few months I’ve been doing this, and I noticed that over and over again at random times, I wrote about how I was feeling particularly thankful for my colleague and Head of Staff, the Rev. Dr. Ken Henry. Or, Ken as I call him. (Sometimes I call him dude, but it’s purely by accident and I feel so bad every time). That said, I realized that I really am thankful for my Head of Staff. I hear great ones are not so easy to come by, so that makes me more thankful for the one I have. As I reflected on why I appreciate Ken so much, I came up with my own “Top 5” reasons that I’m thankful to have him as a colleague and HOS. I thought I’d blog about it. Here it goes. What I mean by this is that he doesn’t have a weird complex or insecurity about having an awesome Associate Pastor (haha!). But really, I noticed that when he hears someone say that I’m awesome, he chimes in and agrees. He’s not afraid that I’m going to steal his thunder. Now, I realize that this may also be because I’m a younger woman—but to be honest, I really think he would be just as supportive of anyone who was in my position, doing great ministry with him at the church. I know that might be a loaded term, but for me, a good mentor is someone who listens and draws out the gifts he or she sees in me—and reminds me that I am capable and able. Also, he has many more years of ministry under his belt—and I really do value the wisdom that has come from his mistakes and his successes over the years. I have this quote hanging in my office, because Ken shared it with me. It says, “The single biggest problem with communication is the illusion that it has taken place” by George Bernard Shaw. My HOS and I meet at least once a week—yes with other staff—but also just the two of us. Yes, of course we discuss the upcoming week and work-related items and people to visit and ideas we might have. But we also check in with one another. It’s this great balance of “how are you, really?” and “Here’s what we need to do.” You would think we wouldn’t need to meet so regularly but we do. And we need it every time. He’s my advocate—and I’m his. You hear that being a pastor can be a very lonely profession. I think this is true whether you have a partner or whether you’re single. Come on, let’s be honest. Pastors see the world differently. I’m not making a value statement here. I’m not saying we’re better or worse. We’re different. We’re pastors! Trust me, if you could see the looks on faces when I tell people I’m a pastor, I remember that what I do is kind of weird to the world. Pastors have chosen to follow this calling in ministry not because we have no other gifts to do other things or because it’s super fun. There’s a constant sense of God working all around us that we want others to engage and experience. Okay, all that to say…what makes my HOS great is that we get one another in a way that many don’t. And because we respect the ministry we’ve each been called to do, I feel that he is my advocate. He’s the cheerleader for the ideas I bring to the table and we can dialogue about ways to make things happen together. I’m also his advocate. I have made a commitment never to say anything negative behind his back or engage others who might be saying negative things about him. If there’s a problem, I respect him enough to talk to him about it directly. If someone else wants to vent, I will listen—but I will not fuel any fires. I’m going to advocate for my HOS or encourage the person to go to him directly. I appreciate that we have this understanding. He prays with and for me—and I pray with and for him. Lest you think we’re super holy, it’s not like we spend every meeting we have in deep prayer. But, for example, do I always say a prayer for him on Sunday mornings when he’s preaching? Yes. Sometimes with him when we check in before worship. Sometimes in my car on the drive over to church. Do I pray for him when he’s off getting ready to send his youngest daughter to college? Yes. Because of course others care—but pastors need prayer too. And sometimes—well, most of the time—our prayer requests and concerns are not on the top of people’s lists. More often than caring about how he’s feeling about his daughter going away to college is the question of “Where is he? Why isn’t he here?” Those are the ones I hear—and I am positive it’s the same way when I’m gone. We pray together. We pray for each other. We love God. We love Jesus. We love the Spirit. And we know that in those personal moments of our own limitations, we need to pray for one another. I appreciate that so much about my HOS. So, that’s a quick and simple Top 5 list for me. I’m sure as I continue, I’ll come up with more. But for those Associate Pastors out there—or those who have been associates, what would you add to this list that makes for a great Head of Staff? In case you’re wondering, my head of staff and I get along. All true! Two of my favorite colleagues. It was such a joy to share ministry with you these past several years, and I look forward to doing so again in the future!!! Okay, Irene, I can’t resist! Rev. Henry can motivate. I’ve seen folks, including myself, happily bend over backwards and push themselves in all sorts of awkward ways for one of his crazy ideas.